The Collector’s Series represents a set of small, signed prints suitable for gifts and smaller spaces. 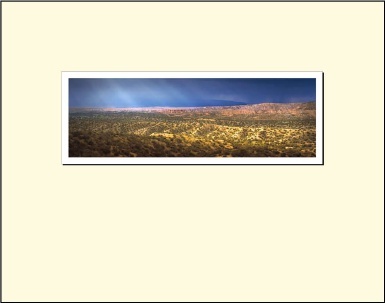 Panoramic prints are approximately 2x8 mounted inside of an 11x14 over mat that folds to form the outside cover. Traditional or rectangular prints are approximately 3x4, also with a folding over mat. Prints are individually signed and details are given on the print surface below the mat opening. All panorama prints are available in both the Collector’s and Museum formats. Traditional, rectangular prints are available in the Collector's size but, at this time, there is not Museum size available. The Museum Edition prints are approximately 7x21 mounted on a 22 x 28 archival matt and then over-matted (or they can be ordered without mats). 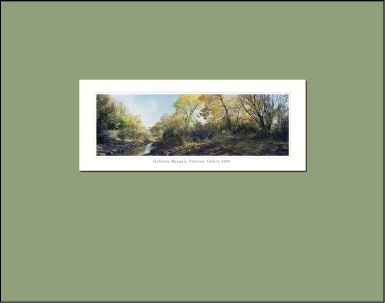 Prints are done in small batches of 5 with the Print Number, Date, Title and Signature added by hand along the bottom. Edition is limited to 100. Museum Edition Prints can also be ordered directly from the New Mexico Museum Society at newmexicocreates.org or any galleries that sell my work. © Richard Fenker 2012: All rights reserved. Images or portions thereof may not be used without the written permission of the artist.